You might think The Walking Dead is heartless and gruesome, but it's nothing compared to what would actually happen in a zombie apocalypse. At least, that's the case researchers at the University of Leicester are making. Most zombie stories are predicated on the notion that humans stand a chance against the zombie invaders, even if it's just a small group fighting for survival. 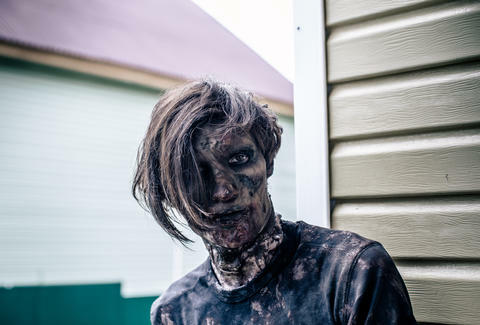 The researchers have dug into what would happen in the event of a full-fledged zombie apocalypse for a paper in the University's peer-reviewed Journal of Physics Special Topics. Unfortunately, it doesn't look good for you humans. Their findings say that 100 days after the zombie outbreak, a population 7.5 billion would be whittled down to "100 to 200 survivors." Those lonely, lonely people would be surrounded by 190 million zombies. The point of their model is to predict how this hypothetical virus would spread. The zombies in the study are given a 20-day lifespan and have a 90 percent success rate of infecting at least one person every day. The epidemic also begins with only one person infected on "Day 0." The study also put together another scenario that boosted the zombie lifespan to a year but added complications like human sexual reproduction and a 10 percent chance that people kill off one zombie each day. The human population still plummets, but recovery was able to eventually take root ...ahem... in about 27 years. Ultimately, the study has taken a tongue-in-cheek approach to a model that looks at the possible spread of a deadly infectious disease. But it's good to know just how many cans of beans you should load into your zombie shelter.